I was so excited when I was chosen for this opportunity, and I am sure many of you can figure out why. I have three girls, of course! So when two Princess Ponies arrived, I was eager to break them out and start playing. Seriously, I was probably more excited than Afton, ha. Meet Diamond and Dewdrop, our Princess Ponies! For a quick breakdown, Pony Royale consists of 12 Princess Ponies, each baring a birthstone gem on her forehead. Diamond is the pony of April and Dewdrop is for December, which was pretty cool since Afton is a December baby. The ponies are meant to encourage creativity through hair and fashion play and they have interchangeable hair and clothing so you can make a ton of unique combinations when you have multiple ponies. Take a look at the below video to see the story of Pony Royale. Afton loves the ponies. And as a 3-year-old goes, she’s pretty possessive of them. The ponies are meant for kids that are 3 and older, and it’s pretty suiting, because Laney and Vivi did get a hold of the ponies and I spent a good hour trying to find all the pieces after that. Do not let small children have the ponies, the little pieces are a choking hazard. Besides the incident involving total destruction by tiny hands, the only issue I had with the ponies is that it’s too easy to remove the parts. I feel like Afton should have to ask me to change out pieces for her; they seem to just slip in and out so most the time Afton plays with the ponies with no hair or accessories. The ponies are supposed to help kids fantasy play as a Princess, which works great, really. Afton will ask me to dress her up in her Princess outfit, and then we will take the ponies and ride off to mystical lands where we eat candy and ice cream and defeat vampires. Yes, vampires. The Pony Royale website is pretty nice as well. It has little bios of each of the ponies, plus an interactive map where you can explore the land and answer fun little polls. There is even a parent portion to the site to help show you how to play with the ponies and your kids to encourage their creativity. All-in-all, Pony Royale is a pretty cool system of toys. Afton adores Diamond and Dewdrop and she plays with them constantly. Pony Royale can be found exclusively at Toys R Us late this month, so keep an eye out and snag them when you find them! Visit the Pony Royale website for more information. 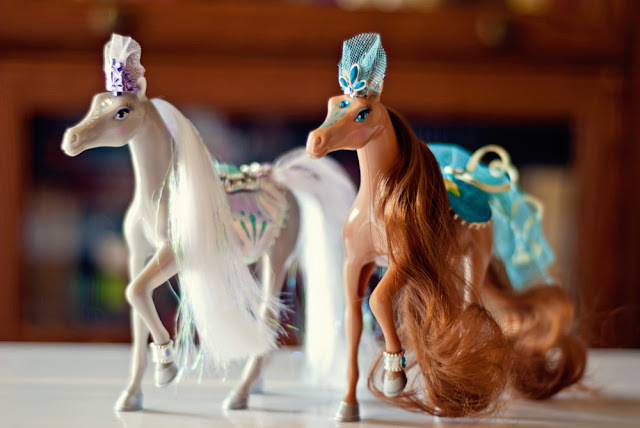 Look for Princess Ponies in stores starting late July! Meanwhile, be sure to check out Pony Royale’s Facebook page and follow them on Twitter! Thanks! They are super fun and the kids love them; I am going to have to pick up some more when they hit the stores! My daughter is obssessed with horses as well! I don't even think I have an actually idea of how many ponies she actually owns. Looks like I am going to have to find these for her. How in the heck did ya make it gallop/walk around like that?! Girl... you blow my mind with your skillz. It's a .GIF Chelsea! All I did was put my camera on the tripod and then I took pics on the horse in different spots so I could string them together and make it look like it was moving! The hardest part was keeping the kids away while I did it, ha ha ha! That video at the end is amazing. I love that you love having this kind of play time with your girls. Ha ha ha it's really just a .GIF, but I love making them! And it is so much fun because it brings me back to my own childhood. I'm a total sucker for the past.